Dinosaur plastic skeletons fake fossil bones are a fun way to add a hands on activity to your child's party. We suggest you bury them in sand or dirt. If you have a sand box that's great. Kids will love being young hunting paleontologist. 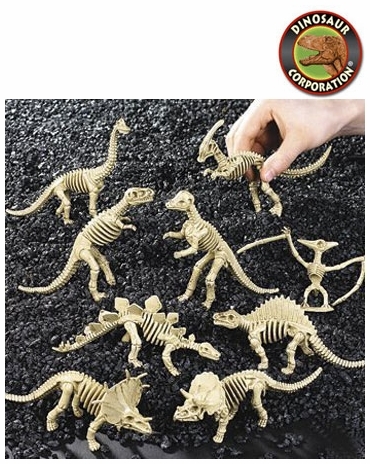 Dinosaur fake fossil bones skeletons are perfect for kids dinosaur activity I Dig Dinosaur! Search in sand and discover your favorite dinosaur toys. Prehistoric dinosaurs are: Tyrannosaurus rex, Triceratops, Brachiosaurus, Dilophosaurus, Pachycephalosaurus, Stegosaurus, Dimetrodon, Parasaurolophus, Pterodactyl, Plateosaurus, Styracosaurus and Edmontosaurus.